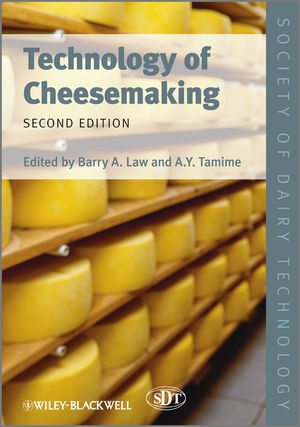 Now in a fully-revised new edition, this book covers the science and technology underlying cheesemaking, as practised today in the manufacture of hard, semi-soft and soft cheeses. Emphasis is placed on the technology, and the science and technology are integrated throughout. Authors also cover research developments likely to have a commercial impact on cheesemaking in the foreseeable future within the areas of molecular genetics, advanced sensor / measurement science, chemometrics, enzymology and flavour chemistry. In order to reflect new issues and challenges that have emerged since publication of the first book, the new chapters are included on milk handling prior to cheesemaking; packaging; and major advances in the control of the end user properties of cheese using key manufacturing parameters and variables. The volume has been structured to flow through the discrete stages of cheese manufacture in the order in which they are executed in cheese plants - from milk process science, through curd process science, to cheese ripening science and quality assessment. Overall, the volume provides process technologists, product development specialists, ingredients suppliers, research and development scientists and quality assurance personnel with a complete reference to cheese technology, set against the background of its physical, chemical and biological scientific base. Preface to the Technical Series. 1 The Quality of Milk for Cheese Manufacture (T.P. Guinee and B. O'Brien). 1.2 Overview of milk composition. 1.3 Principles of cheese manufacture. 1.4 Quality definition of milk. 1.5 Factors affecting the quality of milk for cheese manufacture. 1.6 Strategy for quality milk production. 2 The Origins, Development and Basic Operations of Cheesemaking Technology (M. Johnson and B.A. Law). 2.2 The world market for cheese. 2.3 The fundamentals of cheese technology. 2.5 The stages of cheesemaking. 2.7 Reduced-fat versions of traditional cheeses. 2.8 Whey technology for cheesemakers. 2.9 The role of research and development in the future of cheese technology. 3 The Production, Action and Application of Rennet and Coagulants (M. Harboe, M.L. Broe and K.B. Qvist). 3.1 Historical background and nomenclature. 3.2 Types of rennet and coagulants. 3.3 Molecular aspects of the enzymes in rennet and coagulants. 3.4 Technology of enzymes production. 3.7 Physical chemistry and kinetics of enzymatic coagulation of milk. 3.8 Application of rennet and coagulants. 4 The Formation of Cheese Curd (T. Janhøj and K.B. Qvist). 4.2 Chemistry and physics of curd formation. 4.3 Effect of milk composition on curd formation. 4.4 Effects of milk pre-treatment on curd formation. 4.5 Factors controlling curd formation in the vat. 4.6 On-line measurement of curd firmness and syneresis. 4.7 Cheese with reduced-fat content. 5 The Production, Application and Action of Lactic Cheese Starter Cultures (E. Høier, T. Janzen, F. Rattray, K. Sørensen, M.W. Børsting, E. Brockmann and E. Johansen). 5.3 Production of starter cultures. 5.4 Range of LAB used as starter cultures. 5.6 The types of lactic cultures. 5.7 Modern approaches to the development of new starter cultures. 5.8 Biochemistry of acidification by LAB. 5.11 Development of phage-resistant starters. 5.12 Future perspectives in starter culture development. 6 Secondary Cheese Starter Cultures (W. Bockelmann). 6.3 Classification of secondary starter cultures. 6.4 Commercially available secondary cheese starter cultures. 6.6 Development of defined surface starter cultures. 7 Cheese-Ripening and Cheese Flavour Technology (B.A. Law). 7.2 The breakdown of milk proteins to flavour compounds in cheese. 7.3 Breakdown of milk lipids in cheese. 7.4 Lactose and citrate metabolism in cheese. 7.5 The commercial drive for cheese-ripening and flavour technology. 7.6 Commercial opportunities created by cheese-ripening and flavour technologies. 7.7 Methods for the controlled and accelerated ripening of cheese. 7.8 EMCs and cheese flavour products. 8 Control and Prediction of Quality Characteristics in the Manufacture and Ripening of Cheese (T.P. Guinee and D.J. O'Callaghan). 8.2 Principles of cheese manufacture. 8.4 Cheese quality: influence of chemical composition of milk. 8.5 Cheese quality: effect of milk pre-treatments and manufacturing operations. 8.6 Cheese quality: effect of cheese composition. 8.7 Cheese quality: effect of ripening. 8.8 Quality assurance in cheese manufacture. 9 Technology, Biochemistry and Functionality of Pasta Filata/Pizza Cheese (P.S. Kindstedt, A.J. Hillier and J.J. Mayes). 9.2 Measuring functional properties of pizza cheese. 9.3 Manufacture of pizza cheese. 9.4 Microbiological, proteolytic and physicochemical properties. 9.5 Non-traditional methods of manufacture. 10 Eye Formation and Swiss-Type Cheeses (A. Thierry, F. Berthier, V. Gagnaire, J.R. Kerjean, C. Lopez and Y. Noel). 10.2 Open texture and eye formation. 10.3 Gas formation through propionic fermentation. 10.4 Cheese structure and eye formation. 11 Microbiological Surveillance and Control in Cheese Manufacture (P. Neaves and A.P. Williams). 11.2 Milk for cheese manufacture. 11.5 Maturation of the curd. 11.6 Specialist cheeses and cheese products. 11.9 End-product testing and environmental monitoring. 12 Packaging Materials and Equipment (Y. Schneider, C. Kluge, U. Weiand H. Rohm). 12.2 Cutting of the cheese. 13 The Grading and Sensory Profiling of Cheese (D.D. Muir). 13.1 Introduction to cheese-grading systems. 13.2 Fundamentals of sensory processing. 13.3 Grading systems: defect versus attribute grading. 13.4 The direct link: cheesemaking to consumer. 13.5 Introduction to sensory profiling of cheese. 13.7 Sample preparation and presentation. 13.9 Integrated design and analysis of data. 13.10 Sensory character of commercial cheese. 13.11 Development of flavour lexicons.